The value of proposed U.S. major conventional arms sales agreements totaled nearly $63 billion in 2016—the second highest amount during Barack Obama’s 8-year presidency. More than two-thirds (nearly $44 billion) involved just four Gulf Cooperation Council (GCC) countries—Qatar, Kuwait, the United Arab Emirates (UAE), and Saudi Arabia—that each requested greater than $5 billion in sales. Other state requests amounting to at least $1 billion came from Australia, Iraq, Japan, Norway and the United Kingdom. In total, notifications were made involving 26 different countries plus NATO in 2016. The United States conducts government-to-government arms transfers through the Defense Department’s Foreign Military Sales (FMS) program. Not all notified sales result in final transactions. Under the 1976 Arms Export Control Act, Congress must be notified of proposed sales of “major defense equipment”—as defined on the U.S. Munitions List—that equals or exceeds $14 million; defense articles and services that are not defined as “major defense equipment” that total $50 million or more; and construction or design services amounting to or surpassing $200 million. However, if the proposed sale involves NATO members, Australia, Israel, Japan, South Korea, or New Zealand, the notification thresholds are $25 million for major defense equipment, $100 million for other defense articles and services, and $300 million for construction or design services. Once notified, Congress has 30 calendar days (15 in the case of NATO members, Australia, Israel, Japan, South Korea, and New Zealand) to block a sale by passing a joint resolution of disapproval, although it has never stopped a sale once formally notified. 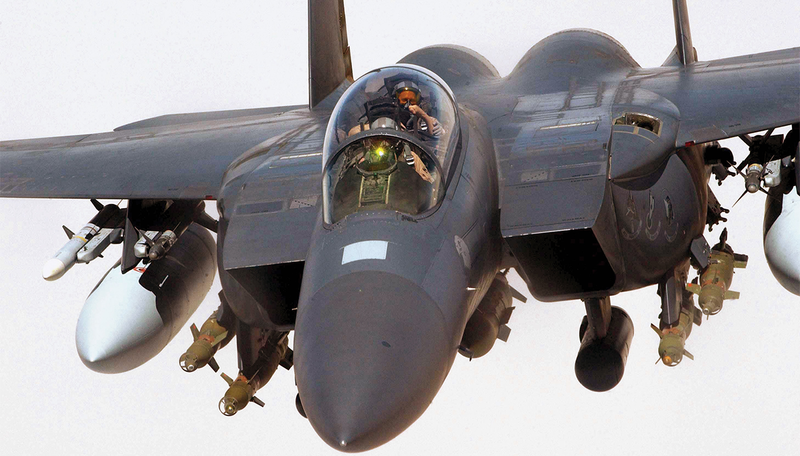 In 2016, Qatar requested the most expensive package of arms sales agreements – more than $22 billion – with weapons, training, and support for 72 F-15QA fighter aircraft comprising the lion’s share ($21.5 billion). Other requests included support and engines for 8 C-17 heavy lift aircraft, 50 Javelin guided missiles, as well as fast patrol boats. Kuwait followed Qatar as the only country requesting more than $10 billion in arms sales in 2016 (approximately $12.45 billion). Most of the proposed sales to Kuwait consisted of 40 F/A 18E/F Super Hornets and related equipment, training and support ($10.1 billion). Kuwait also requested equipment to recapitalize 218 M1A2 tanks, support for its F-18 C/D fighter aircraft, radar systems, and 750 Joint Direct Attack Munition (JDAM) tail kits designed to make gravity bombs into precision-guided weapons. Both the UAE and Saudi Arabia requested sales valued at approximately $5 billion each. Of all proposed sales in 2016, those to Riyadh proved most controversial. In September, 27 senators voted unsuccessfully to block a proposed $1.15 billion sale to provide or repair 153 tanks. In December, the administration notified Congress of a larger $3.5 billion potential sale comprised of 48 CH-47F Chinook cargo helicopters and related equipment, training and support. In 2015 and 2016, Saudi Arabia faced national and international condemnation for its conduct leading a coalition fighting in Yemen, during which hospitals and other civilian areas were attacked by Saudi forces. The UAE’s 2016 request included 37 Apache helicopters, 400 Hellfire missiles, and more than 14,000 bombs among its primarily airpower-focused potential purchases. Below is a chart of the top five countries that sought the highest values in U.S. arms exports in 2016, along with some of their specific requests. 1. The Department of State is also required to report to Congress any commercial sales it approves of “major defense equipment” that amount to $14 million or more, defense articles and services that equal or exceed $50 million, and any items defined as “significant military equipment.” As in the case of FMS sales, Congress can block the sale with a joint resolution of disapproval within 30 calendar days of notification (15 in the case of NATO members, Australia, Israel, Japan, New Zealand, and South Korea). Commercially licensed sales of firearms controlled under category I of the U.S. Munitions List valued at $1 million or more must also be notified to Congress but are not considered here. There are no official compilations of commercial agreement data comparable to the FMS notifications and what exists is often incomplete and less precise than data on government-to-government transactions (Theohary, Catherine A., Conventional Arms Transfers to Developing Nations, 2008-2015, Washington, D.C., Congressional Research Service, December 19, 2016, p. 16). The annual Section 655 report, prepared by the State and Defense Departments for Congress, details commercial licenses approved, but states have four years to act under the licenses. The State Department’s Directorate of Defense Trade Controls has final responsibility for license applications for commercial defense trade exports and all issues related to defense trade compliance, enforcement, and reporting. 2. Congress approved the higher notification thresholds for NATO members, Australia, Japan, and New Zealand in legislation passed in September 2002. South Korea was added to this list in 2008, and Israel was added in 2010. Congress, however, is free to pass legislation to block or modify an arms sale at any time up to the point of delivery of the items involved. Sources: Congressional Research Service, Defense Security Cooperation Agency, and Department of State. For more details on Foreign Military Sales and other U.S. programs that result in arms transfer authorizations and deliveries, please also see the Security Assistance Monitor.